School is back in session, fall is near and the must-have styles of the season are in! 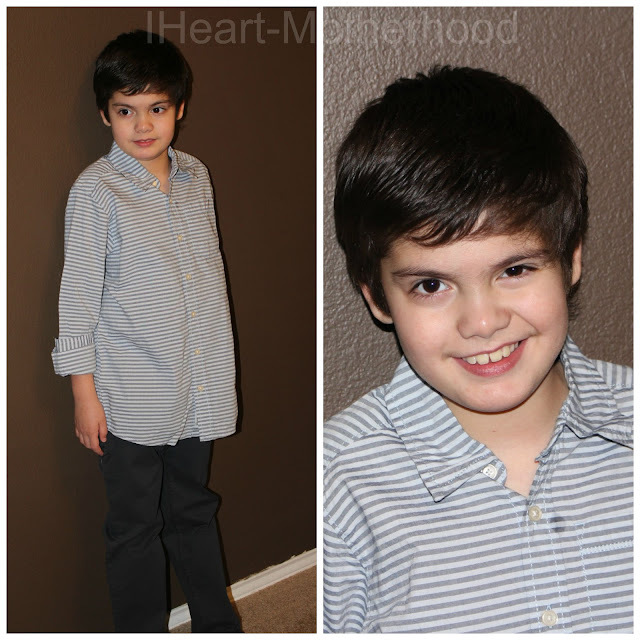 Plaid and denim is what comes to mind when I think about fall fashion along with a family loved brand - OshKosh B'gosh! We all remember our baby's very first pair of adorable OshKosh B'gosh denim overalls, I know I do! OshKosh has come a long way with their fashion and now offer plenty of different pieces designed for today's active, expressive kids! From moto jackets and jeggings for your daughter to glow-in-the-dark graphic tees for your son, OshKosh B'gosh's thoughtful designs, superior materials and construction, and trendy fashions will give kids the confidence to excel in the classroom this year. Send your child off to school this year with B'gosh Blue Jeans - they are back and better than ever! OshKosh B'Gosh has all of the must-haves for today's kids and their active lifestyle! OshKosh has big ideas for this fall season, from B'Gosh Blue Jeans to World's Best Overalls and the New Black, White & Indigo Collection, your child will be in style whether their heading out on the bus or hanging with friends at recess! I was provided a gift card to shop in-store at my local OshKosh B'Gosh! At OshKosh B'Gosh you will find sizes for boys and girls from newborn up to size 10 in store & up to size 12 online! 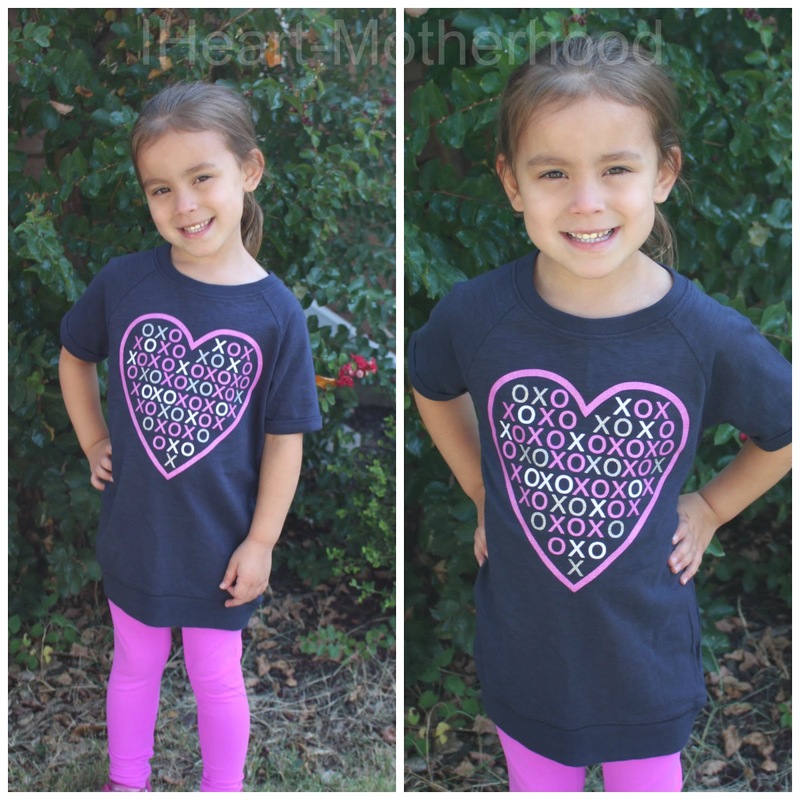 While shopping in-store I purchased a Striped Button-Front Shirt, Raglan Varsity Tee & Slim Slouch Stretch Twills for Big Brother C. I also chose a Puff-Print Peplum Top, TLC XOXO Tunic, Solid Leggings and Neon Skinny Crop Twills for Little Sister C! I'm really loving the new colors this year and I couldn't wait for my children to try on their new outfits! What do you think? Aren't they adorable? My kids are looking great, they are comfortable & we are so ready for fall, I think it's safe to say we've all had enough of the Texas heat! 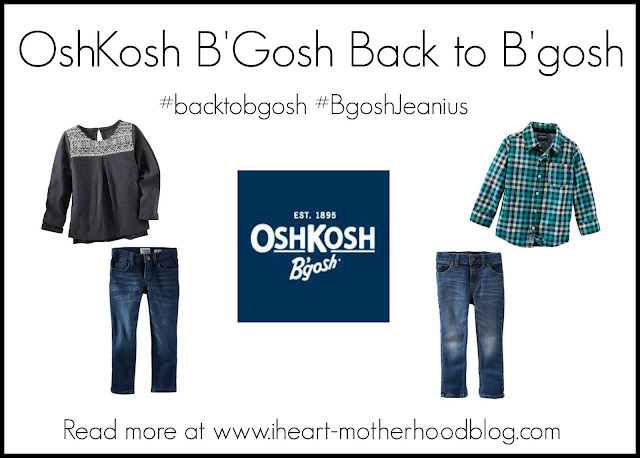 OshKosh B'gosh believes that all kids should have what they need for school from blue jeans to books! They recently launched a "B'gosh Jeanius Campaign". In partnership with K.I.D.S./Fashion Delivers, Inc., and DonorsChoose.org, OshKosh B'Gosh will give customers the opportunity to donate a new pair of jeans or a cash donation to a student in need this school year. So are you ready to do some back to school shopping? 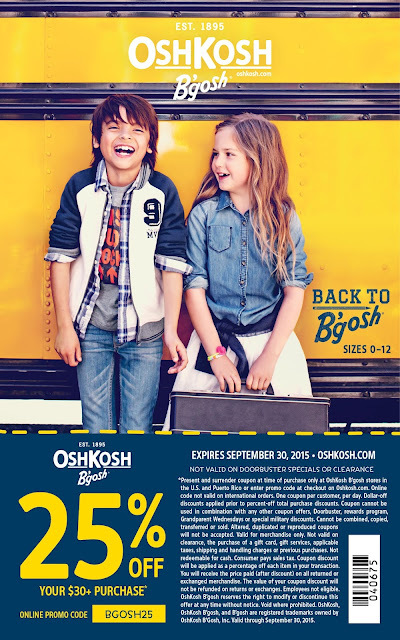 Visit OshKosh B'Gosh online or shop in person! You can find the nearest store using the store locator! Be sure to stay connected with OshKosh B'Gosh on Facebook and Twitter! this sounds like a great time to,go,shopping at OshKosh with the 25% off deal. There is such a wide selection of great looking clothing. We loved Osh Gosh when Boy was a kiddo. The clothes were very long wearing.